A good mix of games at the club today, with a couple of new club members as well which is good to see. FOG-A. Alan and Ross had a medieval battle, using a couple of Alan's armies. FOG-N. Brett (Austrians) played Philip (Netherlands). 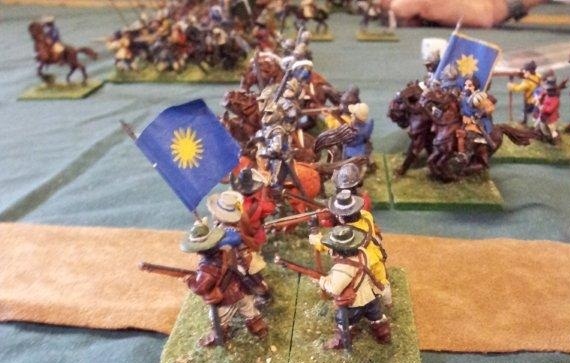 The Netherlands attack soon turned to a fighting withdrawal, ending with a 13-12 draw in favour of the Austrians. Flames of War. A couple of WWII tables had games between Michael and Gregg, and Steve and Robbie. 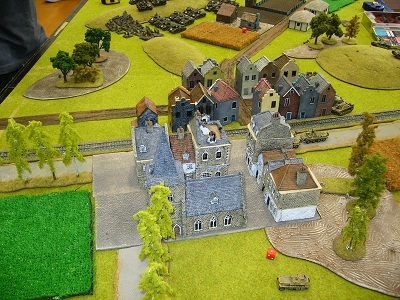 Alan and Michael had a 15mm FOG-R game, using Royalists and German Catholic Imperialists. In a FOG-N game, Kit got a 24-1 win with 1815 British against Philip with the 1815 Netherlands corps. Rob tried out the Victory at Sea rules, doing the River Plate scenario. Nicon 2012 was hosted by The City Guard in the Freemans Bay hall. There were lots of Warhammer fantasy and 40K and Warmachine games, and DBMM 25mm ancients, FoG 15mm Napoleonics, and Flames of War late war in the historical competitions. There were 6 players in Ancients, 14 in Napoleonics (including Al, Andrew, Brett, Kendall, Kit, Mike, Philip, Robbie, and Stu from the NSWC), and 12 in FoW (with Ken and Steve from our club). Kendall won the Napoleonics competition, using an 1807 Russian cavalry corps, and Philip was second with an 1815 Netherlands army. 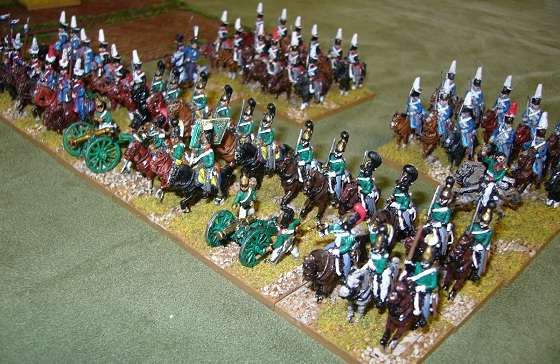 Bryan from the South Auckland club won the prize for the best painted army, an excellent 1809 Austrian army of AB figures. Napier will be hosting Nicon 2013. DBR 25mm. John and Richard had a couple of DBR games. In the first, a 1520s period game, the Imperialists took on the Venetians. In the second game, the Royalists defeated the 30YW Germans. 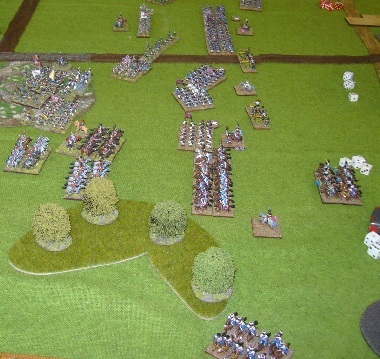 There were several FOG-Napoleonics games, as we are getting in some practice before Nicon next week. Rob (Poles) beat Philip (Netherlands) with a 40-20 victory. Some enterprising Polish cavalry charged a Dutch square, passed through, and then rode on to occupy the Netherlands' LOC. Meanwhile a Polish infantry assault routed three defending Dutch militia from their hill, taking the rest of the army with them. Andrew (Russians) played Michael (British) in a practice game. Michael then had a second game against Kit. In a British v British dress rehearsal, Michael got a decisive 30-10 win, losing only 1 spent cavalry base. Plus we'll also take the credit for a former club member, Steve Hill, Fallschirmjägerkompanie, 79.40, Second Overall. FOG-Ancients. Alan (Republican Romans) played Philip (Pontic). It was an epic struggle, with both armies only one unit away from breaking after a long fight. Flames of War. Rob won a game against Steve, a tough night fight between British and Finnish Infantry; 25 pdrs took out a KV1. Natcon was held in Hamilton this year, and although there was a fairly low turnout overall we had a good contingent from the NSWC there. Ken was in the Flames of War Early War Competition, using a Panzer III army. Mike was in Late War, and got second place using German armour. The Hand of God points the way! Stu took the Alwa army to a DBR competition for the third time. He came fourth this time in the nationals with two good wins and a draw. There are more pictures and a tournament report in The Wargames Room. 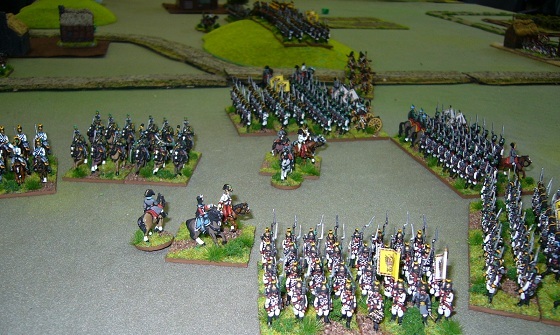 Most of us from the club were playing FOG-Napoleonics, together with several of the South Auckland club members. Our armies were: Al (British peninsular), Andrew (French and Italians), Brett (1809 Austrians), Kendall (1809 Russians), Kit (1815 British), Philip (1815 Netherlands), and Robert (Poles). Philip was 1st, Kit 2nd, and Al 3rd. The picture here shows the battle between the British and Poles. There's a big cavalry scrap going on next to the forest, while another Polish lancer unit makes a wide sweeping move around the other side of the forest... but arriving too late! Mark (Parliamentarian) defeated Philip (Neapolitan) 9-1. Today we had what may well have been the last of the games using the draft FOG-N rules, with the published version expected here in a couple of weeks. Andrew's 1809 French and Italians defeated Al's Peninsular British, while on the next table Kit's 1815 British beat Philip's 1815 Netherlands and Brunswicker force. In a Warhammer game, Dan's Skaven took on Rob's Empire. 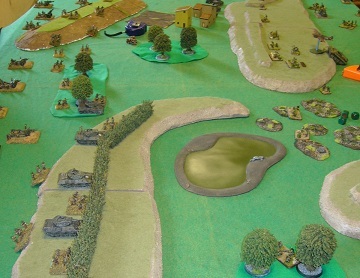 Ken and Steve had a Flames of War game, with the US forces defeating the Fallschirmjager. 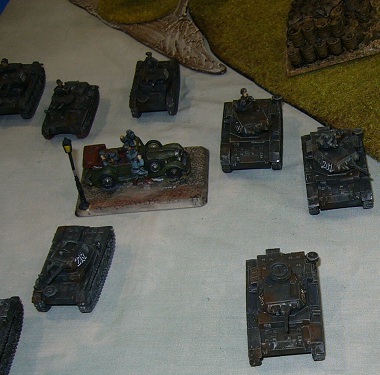 Bad luck for the Germans who lost their Tiger on the first turn! As well as the AGM, there were four Flames of War games between Ken, Kit, Lee, and Robbie. Andrew (Italians and French) beat Brett (Austrians) in a FOG-N game. Battlecry 2012 was held in the ASB Stadium in Kohimarama. Half of the FOG-Ancients competition were NSWC players: Rob (Byzantines) - pictured here taking on the Arab Conquest army; Sam (Syrian States); Michael (Early Zhou Chinese); and Philip (Muslim Indian Sultanates) - a pretty army with lots of elephants, coming last in the competition. DBMM 15mm - Al's Spartans got a 16-9 victory over Philip's New Kingdom Egyptians. FOG-A 15mm - Michael's Urartians defeated Rob's Byzantines. Flames of War - Kit (Germans) played Steve (French led by de Gaulle). It was a win to the Germans; De Gaulle was finally killed and the mission finished on turn 8; Two German platoons were destroyed, but with the new V3 rules, because they had at least 9 platoons only 1 was counted as lost. It was a quieter meeting at the club today, with lots of people away for the long weekend. Stu was over at CanCon, coming 4th in DBR 15mm using the Fronde French. Benny was playing 25mm DBMM at ValleyCon, taking second place and winning the prize for the best army (Marian Romans). We had two games at the club. Michael and Ken had a FOG ancients game, using Urartians and New Kingdom Egyptians. The heavy Urartian chariots were too much for the light Egyptian chariots. Plus it was Ken's first FOG game. In the other game of FOG Napoleonics, Kendall's 1807 Russians (based on the Battle of Friedland) got a 20-4 win over Philip's Netherlands 1815 army. Eleven of us at the club, and only two games... how is that, you ask? Well there was a Flames of War game on one table, and a multi-player FOG-N game spread across three other tables. We did a refight of Austerlitz. The French players were Andrew, Rob, Kendall, Mike, and Al, and the hapless Austrian and Russian allies were Steve, Brett, Kit, and Philip. A glorious victory to the French, who inflicted 50% losses on their opponents while losing little over 20% of their own forces. Also, a reminder that we have another meeting next weekend, being the 5th Sunday of the month. The year got off to a great start with a lot of games at the club today. SAGA. Benny and Mike visiting from AWC had a demo game of Saga, 25mm Dark Ages skirmish. Grant and John had a futuristic battle, using 40K figures.